I consider this institution as the center of spiritual practices along with academic excellence. The research and personality development programs should be undertaken for heightening the life of students. Institution should teach students how to be free from addiction and anxiety and how to apply their earned knowledge in the right direction. The institute should accelerate knowledge through studies, writing, research, etc. The great purpose of education which Lord Mahaveer described are to gain knowledge, concentration, to be self-stand and help others in order to make them stable etc. which should be fulfilled through it. This institution will make its special identity if it strives for enhancing the transcendental and spiritual personality along with worldly personality. Acharya Tulsi was the religious teacher and late ninth Acharya of Terapanth sect. His passage of 84 years and 62,000 miles on foot, came to an end on 23rd June 1997. Acharya Tulsi was born in 1914 in Ladnun (Rajasthan), he became a monk in 1925 and an Acharya of the Terapanth sect in 1936. He initiated more than 776 monks/nuns. He has been an accomplished poet, author of over a 100 books, as well as a distinguished religious leader. 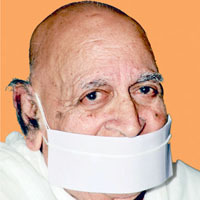 Acharya Tulsi started his Anuvrata movement in 1949. He has been a proponent of Jain unity regardless of the sectarian differences. His message was not just for the jains but for the entire humanity. In 1980 he created a new rank of apprentice monks "samanas/samanis" who are allowed to travel overseas. He created a "Jain Vishva Bharati" institute in Ladnun. Dr. Radhakrishnan in his "Living with Purpose" included him in the world's 15 great persons. He was given the title "Yuga-Pradhan" in a function officiated by President V.V. Giri in 1971.During his tenure he was greatly aided by Muni Nathmal, later called "Yuvacharya Mahaprajna". Tulsi relinquished the leadership to Mahaprajna in 1995. Acharya Shree Tulsi expired (Devlok) on 23rd June' 1997 at Gangasahar (Rajasthan State).